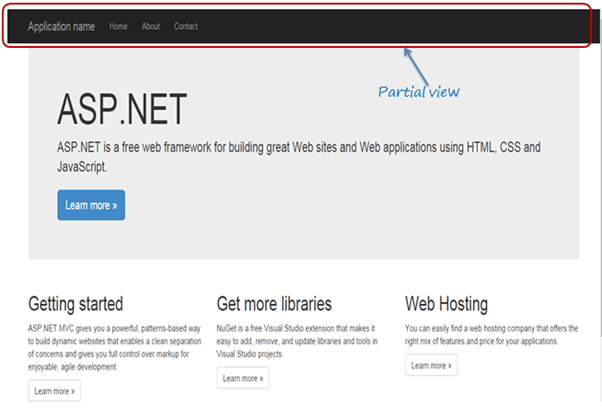 In this section you will learn about partial views in ASP.NET MVC. 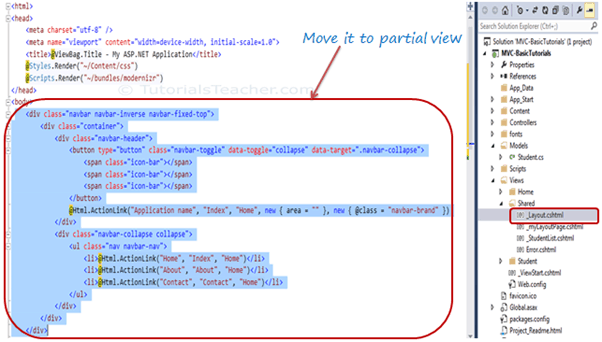 Partial view is a reusable view, which can be used as a child view in multiple other views. It eliminates duplicate coding by reusing same partial view in multiple places. You can use the partial view in the layout view, as well as other content views. To start with, let's create a simple partial view for the following navigation bar for demo purposes. We will create a partial view for it, so that we can use the same navigation bar in multiple layout views without rewriting the same code everywhere. The following figure shows the html code for the above navigation bar. We will cut and paste this code in a seperate partial view for demo purposes. If a partial view will be shared with multiple views of different controller folder then create it in the Shared folder, otherwise you can create the partial view in the same folder where it is going to be used. In the Add View dialogue, enter View name and select "Create as a partial view" checkbox and click Add. We are not going to use any model for this partial view, so keep the Template dropdown as Empty (without model) and click Add. This will create an empty partial view in Shared folder. Thus, you can create a new partial view. Let's see how to render partial view. You can render the partial view in the parent view using html helper methods: Partial() or RenderPartial() or RenderAction(). Each method serves different purposes. Let's have an overview of each method and then see how to render partial view using these methods. @Html.Partial() helper method renders the specified partial view. It accept partial view name as a string parameter and returns MvcHtmlString. It returns html string so you have a chance of modifing the html before rendering. MvcHtmlString Html.Partial(string partialViewName) Renders the given partial view content in the referred view. MvcHtmlString Html.Partial(string partialViewName,object model) Renders the partial view content in the referred view. Model parameter passes the model object to the partial view. MvcHtmlString Html.Partial(string partialViewName, ViewDataDictionary viewData) Renders the partial view content in the referred view. View data parameter passes view data dictionary to the partial view. MvcHtmlString Html.Partial(string partialViewName,object model, ViewDataDictionary viewData) Renders the partial view content in the referred view. Model parameter passes the model object and View data passes view data dictionary to the partial view. The RenderPartial helper method is same as the Partial method except that it returns void and writes resulted html of a specified partial view into a http response stream directly. RenderPartial(String partialViewName, ViewDataDictionary viewData) Renders the specified partial view, replacing its ViewData property with the specified ViewDataDictionary object. The RenderAction helper method invokes a specified controller and action and renders the result as a partial view. The specified Action method should return PartialViewResult using the Partial() method. RenderAction(String actionName) Invokes the specified child action method and renders the result in the parent view. RenderAction(String actionName, Object routeValue) Invokes the specified child action method using the specified parameters and renders the result inline in the parent view. RenderAction(String actionName, String controllerName) Invokes the specified child action method using the specified controller name and renders the result inline in the parent view. RenderAction(String actionName, RouteValueDictionary routeValues) Invokes the specified child action method using the specified parameters and renders the result inline in the parent view. RenderAction(String actionName, String controllerName, Object routeValue) Invokes the specified child action method using the specified parameters and controller name and renders the result inline in the parent view. RenderAction(String actionName, String controllerName, RouteValueDictionary routeValues) Invokes the specified child action method using the specified parameters and controller name and renders the result inline in the parent view. So now, we can use any of the above rending methods to render the _HeaderNavBar partial view into _Layout.cshtml. The following layout view renders partial view using the RenderPartial() method. RenderPartial returns void, so a semicolon is required at the end and so it must be enclosed in the braces. 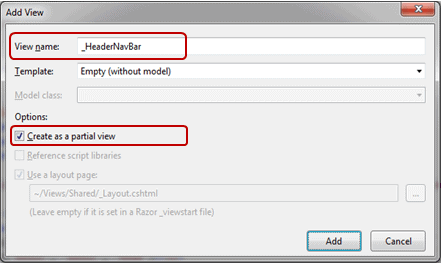 The following layout view uses the Partial method to render partial view_HeaderNavBar.cshtml. @Html.Partial() method doesn't need to be in code block because it returns a html string. You will see following UI in browser when you run the application. So in this way, you can use partial view without any differences in the UI. Learn the Difference between html.Partial and Html.RenderPartial. Partial view is a reusable view, which can be used as a child view in multiple other views. Partial view can be rendered using Html.Partial(), Html.RenderPartial() or Html.RenderAction() method.